"Kaitlin was a wonderful teacher, she was the first teacher who taught me about the 'flow' of yoga, making it into an art form. She was completely accepting of everyone's differences, I remember her comparing us to diverse trees in a forest! I always came away from Kaitlin's classes feeling well stretched and balanced but also with a gorgeous glow, feeling very loved!" 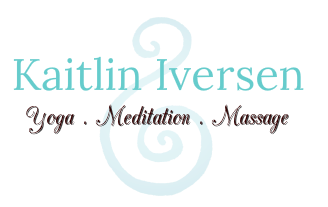 "Kaitlin's instruction in yoga offered me a peace and fulfillment I was fearful I would not be able to attain. Having only been introduced to yoga in ashrams and temples throughout SE Asia, my experience with the practice had been incredibly spiritual and mindful from the start. I was so fearful that when I left thoughtful ashrams, and practiced in yoga studios, that the practice would be reduced to some western misinterpretation, i.e calorie burning, weight loss, etc. Kaitlin's incredibly mindful yoga instruction put that fear to bed immediately. If anything, the practice felt more sustainable. It stopped being a theory, and started being a community. I have asked for instruction and clarification on poses in my continued travels this year and Kaitlin has taken time to offer thoughtful resposnses every time, without fail. Whether you are seeking a healthy body or an open mind, you will be provided for completely through her instruction." "Hi my name is Denise Kolcze and live in Brisbane, Queensland, Australia. I met the beautiful Kaitlin in Cambodia in March of 2014. My sister and I went on a Head Heart and Hands holiday and stayed at Angkor Bodhi Tree Retreat and Meditation Centre. We loved it there as we had meditation and yoga morning and night. My favourite at both was Kaitlin. She is a professional and caring and has the most beautiful smile. Loved our time with her. Thank you Kaitlin!"